With Waheguru Ji’s blessings, its more than 2 years now that sangat are doing regular kirtan samagams. Akhand Kirtan Samagams were started from Gurdwara Aweer in near around mid of 2006 by sangat and then we use to have regular programs at Gurdwara Al-Quoz & Gurdwara Automech, Aweer. When Gurdwara Aweer got closed, sangat started hosting week-end kirtan samagams at someone’s house. One of the nice thing about having sangat at home is that it is very cozy and everyone gets together. Now with Guru ji’s blessings, we have a big SANGAT FAMILY. We will share few memorable moments of this 2+ years journey of Kirtan Samagams with sangat for few coming dayz. Enjoy!!!!!!! 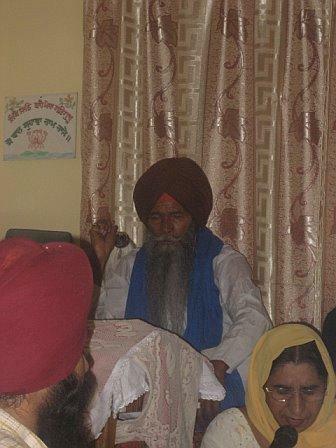 Bhai Najjar Singh Ji ( He belong to m..l.. family. After coming to Dubai, met gur-sangat and with Guru ji’s blessings, he took amrit and joined Khalsa Sangat. Very inspiring, humble n chardikalaa personality. waheguruoooo!! 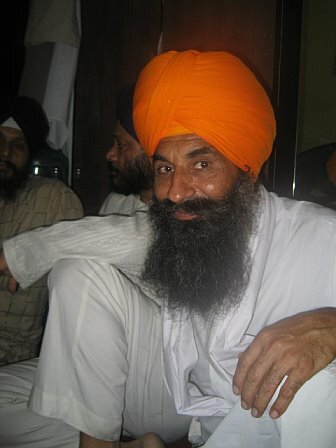 Bhai Choor Singh Ji aka Gurooo Gurooo Singh. This singh use to do lot of simran in sangat. Alwayz, we saw smily on his face. He left us last year. 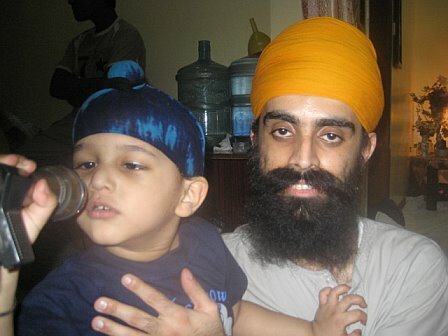 Bhai Mehtab Singh Ji, Shj aka Rochak with lil tabla champ Divjot Singh . This singh is also a chardikalaa singh n inspiration for all of us. He belong to HINDU family. With Guru ji’s kirpa, got amrit nector and joined KHALSA Sangat 4 years back in USA where he gone for studies. He was regular attendee of kirtan samgams when he was in UAE. Now a dayz, he’s back to USA for higher studies. 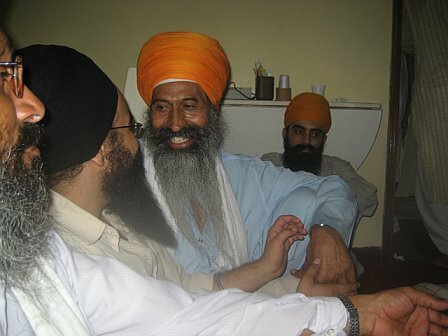 Bhai Sukhdev Singh Ji , Jathedar of PANJ’s in Dubai. Bhai sahib ji does sewa of JATHEDAR SINGH in AMRIT SANCHARS in Dubai. One thing I noticed, bhai sahib ji has a lot of Banis kanth (remembered by heart) n he never uses Amrit Kirtan (pothis) when ever he does kirtan. . Inspiring personality!!! Be tuned for more chardikalaa pictures from DUBAI SANGAT!!!!!!!! !